MS. DIANE REHMThanks for joining us. I'm Diane Rehm. Alzheimer's disease is considered one of today's most pressing and least understood health epidemics. But my guest today understands it all too well. In a new book, she talks about her husband's battle with early onset Alzheimer's and explains why she made the choice to care for him at home for the past two decades. MS. DIANE REHMHer book is titled "Slow Dancing With A Stranger," an Emmy Award-winning journalist Meryl Comer joins me here in the studio. Throughout the hour, I'll look forward to hearing your questions, comments. Join us on 800-433-8850. Send us an email to drshow@wamu.org. Follow us on Facebook or send us a tweet. Good morning, Meryl. It's good to see you. MS. MERYL COMERThank you, Diane. Wonderful to be with you. REHMThank you. Your first chapter is titled "Every 68 Seconds." What do you mean by that? COMERDiane, every 68 seconds, another of us falls victim to this disease. It's a perfect storm. 76 million baby boomers turning 65, 4 million a year for the next 20 years. We are right at the point of an epidemic that globally impacts 44 million, 5.4 million in this country. It's right below the surface, Diane, and we're not paying attention. REHMWould you read for us the first part of your first chapter? COMER"The man I live with is not the man I fell in love with and married. He has slowly been robbed of something that we all take for granted, the ability to navigate the mundane activities of daily living, bathing shaving, dressing, feeding and using the bathroom. His inner clock is confused and can't be reset. His eyes are vacant and unaware as if an internal window shade veils our access. COMERBefore I grasped what was happening, I was hurt and annoyed by my husband's behavior. Those feeling dissolved into unconditional empathy once I understood the cruelty of this diagnosis, early onset Alzheimer's. He was 58. At first, I ran interference and fought for him because it was the right thing to do. He was slipping out of control, confused, childlike and helpless. His social filters stripped away. COMERHe shadowed me because I was familiar and safe, even when he could no longer remember my name. I always loved him, but during our marriage he was often aloof and unreachable. In illness, unlike in health, he made me feel needed and important to home. Neither a scientist nor a neurologist, I have spent close to two decades trying to decipher what's going on in my husband's head. How hard and unfair it is for a smart man to lose pieces of his intellect and independence as the circuitry of his brain misfires and corrodes. COMERNo new short term memories stick. His internal navigational compass is shut down. His disease is my crossword puzzle. Harvey has long forgotten me, but I am constant his co-pilot and guardian. Every conversation is inclusive and respectful, even though he is often unintelligible or mute. It is a charade that never ends. I bear all burdens of decisions for both of us. The demons and terror of his world define mine. COMERAny challenge is self-defeating. I play into his reality and pretend that his fate and our life together are not doomed. Unfortunately, I know better. 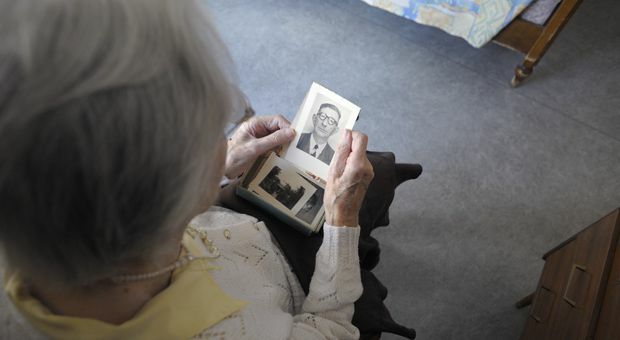 Alzheimer's distorts and destroys shared memories that bind family ties. Caregivers are not unlike victims who survive a hurricane and find ourselves shifting through the rubble to rescue fated, storm-drenched photos or sentimental objects. COMERWe piece together what's left of our past and struggle to put down building blocks for the future. I need to make some sense of my journey through this storm." REHMMeryl Comer reading from her new book. It's titled "Slow Dancing With A Stranger: Lost and Found in the Age of Alzheimer's." Meryl, talk about those first early days of realization that your husband was not just behaving oddly towards you, but really towards the world. COMERWell, let's go back 20 years when Alzheimer's wasn't on anyone's radar screen. COMERLet's look at someone young at the top of his game professionally, the chief of hematology, oncology at NIH, a distinguished professor, long distance runner, 200 published papers. He maintained his brain and it just didn't matter. But back in those early days, what we've learned from the Academy of Neurology is that behaviors change in the beginning so someone who is a type A becomes an extreme type A or there's an arrogance or an aggressiveness that occurs and you begin to watch it. COMERI call it the garden variety grounds for divorce, Diane. It's those types of behaviors. They're extremes of the personality in the person you knew. REHMGive me an example of that behavior toward you. COMERInexplicable rage over situations that did not deserve rage, gestures from other people that sent him into a verbal rage, the disorder, so self absorbed there was no way in to have a conversation with him. But what I learned later, Diane, is what happens is that smart people hide out in this disease and the hippocampus goes into overdrive so they are working very hard at maintaining control. COMERNow, my husband was in denial all the way into the disease, which made it even harder because here is a doctor, what's wrong with a doctor? And he took himself off patient care, but he could not give up his research. REHMAnd what was so interesting to me in reading this book is that the first doctor you took him to because you were so concerned about him almost, and this is an exaggeration, almost patted you on the head and said, don't worry, little lady, your husband is a strong man. COMERDiane, that's not an exaggeration. It was an insult. I'm a doctor's wife. I had typed up my observations. I had shared those informations and combined them with those from his colleagues at work so it was not just his little wife concerned about her husband's behaviors. And they disappeared and came back 20 minutes later and he said, don't worry. No gross abnormalities. Give your husband a break. Just take a vacation. COMERHe's under stress. And they gave him an antidepressant. REHMAnd what did that do? COMERWell, it did nothing, except it made me his victim because then he was angry. He had gotten the clean bill of health and then I became the one that was holding him back from everything he wanted, when I was really running interference and trying to help him. REHMIt's fascinating to me because his colleagues in the laboratory, his colleagues at NIH began to observe these behaviors as well. They even weren't concerned about the research he was doing and whether it was correct. COMERDiane, what happens, and this is a huge issue, is infrastructure fills in around people in positions of authority. So, again, not unlike a spouse who plays into the denial of a husband who is misbehaving in any way, in the early stages of the disease, they don't want to see. And what are they doing? They are challenging the very essence of who someone is. They're challenging their mind. COMERSo they always assume that it's something else. Rita Hayworth, the actress, they assumed that she was drunk all the time when it was dementia. (unintelligible) morbidities with this disease, Diane, that many people just don't understand and the caregiver is the keeper of the secret. We work very hard to protect a loved one's dignity. We see that as our role and I feel that that, in fact, has held us back from the kind of ground swell we need around this disease because no one sees what this disease is like. COMERIf you'll recall when President Reagan and Nancy Reagan came forward, that was a very brave statement. COMERBut if you really follow it, and to her credit, you never saw President Reagan diminished. So she was protecting her husband and a legacy and I think that's what most caregivers see as their role. REHMHow many years after these behaviors began did you actually get a diagnosis of Alzheimer's? COMERWe were close to three years in. REHMThree years. And by that time, had he stopped working? COMEROh, he had been -- he had taken himself patient care. He had been relieved of his duties. He walked around with his briefcase. REHMHe walked around where with his briefcase? COMERWell, first it was at the NIH and in the library and then at home, but he was taken off patient care. REHMMeryl Comer, her new book "Slow Dancing With A Stranger: Lost and Found in the Age of Alzheimer's." Give us a call. I look forward to hearing from you. REHMAnd welcome back. Meryl Comer is with me. You may remember her from a very long and productive television career. She won Emmy's for her reporting. She is a veteran television producer and a business talk show host. She is now president and CEO of the Geoffrey Beene Foundation Alzheimer's Initiative. And 100 percent of the proceeds from this book will support Alzheimer's research. REHMThe book is titled, "Slow Dancing with a Stranger." Meryl, when you finally realized that your husband really did have Alzheimer's did you try to place him in nursing care? COMERAgain, I have to take you back 20 years, Diane. Alzheimer's was an unknown, not discussed, very little information. We did know that it is not a normal part of aging. This is a neurodegenerative disease that is fatal. No disease-modifying drugs, not 20 years ago. But, Diane, 20 years later, no new disease-modifying drugs. COMERNothing. None. So it was very difficult at that time in the -- he became very belligerent, Diane, to the point where I was told he was too dangerous to come home and then no one wanted us. The fallacy is that all long-term care is private pay. Medicare does not pay. They don't have to take you. And they don't want problem patients. So we were rejected in facility after facility. And I finally had one facility to take us with private-duty nurses. I slept on the floor at night. And we lasted about eight weeks. REHM…on the floor at night. REHMNow, in the facility in which my husband was, Brighton Gardens, in Friendship Heights, many, many patients with Parkinson's disease, as my husband had, but a floor dedicated to Alzheimer's patients. Now, I think that is more the case now, don't you? COMERBut if you go back 20 years, no one needed specialized dementia training to even care for these patients. COMERThey assumed it was custodial. Very different. The behaviors are inappropriate, which is why you pull a loved one away, again, you're protecting their dignity. So people don't see the disease. REHMNow, why were you kicked out after eight weeks? COMEROn his part. On his part. REHM…or the doctors could control. REHMAnd did you find another institution that would take him? COMERDiane, that was my first attempt. I had private-duty nurses. I tried to protect the nurses. I actually put them through self-defense training. I said, "You're as important as my husband to me. If there's an issue step away, the facility has back up." But there was no back up. So I brought him home. I made a decision to bring him home, not anticipating the man who had left four months earlier didn't recognize home. Couldn't get up the stairs. It created a whole other nightmare, crisis. COMERI moved from crisis to crisis. Now, every family is different, Diane. We're talking about an extreme, but I've also seen it in a more typical way. I've cared for two loved ones with this disease. But he was young, strong and I made mistakes along the way, Diane. I had seen people in nursing facilities in wheelchairs. I said, "Well, that's not going to happen to my husband." So I took him to the gym. I thought, "Well, muscle memory will keep him strong." COMERDiane, I was taking him through exercises. He would get stuck and I would help him finish. He was dementing and getting stronger. So I created a problem. What I learned after the fact is many people in facilities are in nursing chairs and they're mobile, but there's no staff to take them for a walk. REHMExactly. So indeed you were making him stronger. We should say he was 6'2". How much did he weigh? REHM…but he was strong. Did you not have concerns that he would overpower you? REHMAnd did he on occasion? COMERYes, Diane. I was always on guard. REHMAt one point, Meryl, he hit you in the mouth and he knocked your teeth out. REHMYou put yourself at risk with this man you love because you wanted to protect him. COMER…taking care of loved ones. COMERAnd my heart goes out to them. And everyone's slightly different. So when I wrote -- disease needs a human face. But this problem is so pervasive it's overwhelming. REHMDescribe the kind of care that you have put together in your own home, where I think listeners should know, not only do you now care for your husband, who is still very much alive, who doesn't know you, who rarely moves out of bed now, as well as, your mother, who also has Alzheimer's. Describe the kind of care you give and you've put together. COMERWell, first of all, I want to shout out to all professional caregivers. This is very hard work, Diane. They don't get the credit they deserve. But quite frankly, Diane, I made it up as I went along. There is nothing I ask the caregivers that I have to do, they haven't seen me do. We've cleaned up messes together. We're -- we've become a family. You have to -- and I lead by example. COMERAnd I've pulled out every single trick, Diane, that I have ever learned in corporate America, from giving team awards at Christmas time and letting them vote on who deserves it. They've earned it. They're family. I take -- I care about them as much as I do about my husband and my mother. But I've tried all the therapies. I mean, what's ironic, Diane, is the care research has improved, but it hasn't filtered down to home care. COMERI believe I do palliative care. Terrible name. It just means that you play to whatever strength a loved one has for as long as you can do it. And then with this disease, you have to let it go. You can't fight. You just move on. And it's a constantly shifting sand of one challenge after the other. As soon as you think you've got something straight, it falls apart. I've done music therapy. COMERAgain, it lasts for a moment in time and then it's no longer relevant. So I have tried everything, including, Diane, quite frankly, understanding how desperate patient populations can be. I went to Europe six months before memantine was approved by the FDA. I was that desperate. I thought if I can get a little more control -- and I had read that the side effects were minimal. COMERI went to Europe and got pills -- at $200 a pill, six months before the FDA approved it. But I was living on the margins and keeping my husband out of a facility was my intent. REHMDid that medication alleviate any of the symptoms? COMERAgain, it's very individual. In our case it bought me a margin more of cooperation. And that made it possible for us to sustain him at home. REHMBut tell me, again, what kind of around-the-clock care you have put in place. How many people are there with you? COMEREveryone is part time. I do -- just came off a 12-hour shift that I do every day. I do it, really, Diane, at this point, it's not good for my health, but I do it to slow the financial bleed of this disease. It is bankrupting for families. I do -- people go into retirement today with an average of $6,000 in savings. That's gone in a month. This is out-of-pocket care. The government does not pay for long-term chronic care. COMERSo everyone is blind-sided by the bankrupting nature. 70 percent of families, Diane, try to take care of a loved one at home. But there's always an episode where somebody is violent. The caregiver gets sick. These are all issues that are floating around every story that you'll hear. REHMSo the financial costs for you per month, generally speaking, would be what? COMERWell, I look annually. It's around $140,000 a year out of pocket. And I do 24/7. I'm the case worker. I'm the cook. I'm the shift, as well. REHMAnd there are people close to you, friends, supportive friends, family, who love you, who love your husband, who have said to you, "Meryl, you cannot continue to live this way. This is beyond your own health and strength." And what do you say to them? COMERDiane, there are two things that are going on in that conversation that you've just described. And one is the fact that financially, for any family, you know, two adults, in their prime, out of work, play that out for 20 years. So you're just slowing the bleed. I'm a woman with two long-term care policies because I know the costs of care. I'm terrified for young -- for women. You know, women are two-thirds the caregivers. But we're also two-thirds the patients. COMERSo I am very concerned about this trajectory and what's going on. The other thing is the doctors. The doctors, in hindsight, kept saying to me, "Well, he can't last long." Early on said, "Patients don't last long." And I thought, "Well, I've pushed the really hard parts. He deserves the dignity. I can tough it out." COMERWell, Diane, I've said, "I can tough it out for 20 years." And I think that was a disservice. The other disservice is the fact that doctors, even today, 20 years later, Diane, are reluctant to diagnose because they can't treat. REHM…them for raising something like $20 million in the number of months they've been able to do it. And yet, the number of patients with Alzheimer's is how many times greater than that of ALS? And still the research has not found a way to deal with or a cure for Alzheimer's. COMERWell, first of all, Diane, I applaud what has gone on with ALS. COMERI find all disease cruel. And I love the fact, Diane, that it was organic. COMERAnd it came out of a young man with the disease. COMERAnd that's what I love about advocates and why I'm so proud of what we've done with UsAgainstAlzheimer's and a network. Diane, I would not be here in front of you, quite frankly, if I had not flipped the pain and become the advocate. The disease will win at home. And how you manage your pain matters. I wanted it to be productive. I didn't want other families to live the way I lived. Some people write songs, other people write books. COMERSome people march. But what I love about what we've created is that we respect the dignity of the individual. And when we come together it's the power of us, women, African Americans -- even in research today, Diane, they've finally realizing what they realized in cardiovascular disease. That there's a difference between men and women in Alzheimer's disease. Women progress faster. If it's on the maternal side you're more likely to get the disease. COMERAll of these issues are now coming to the fore, which means that we need to step up for the prevention trials, the A4 prevention trials. If you're 65 -- and I've signed up, by the way, Diane. I have to admit I'm in that category. They need asymptomatic so we can get ahead of this disease. REHMBecause your mother has it. COMERBecause my mother has it. I've even had my genome done. That's how terrified I am, Diane. I do not want my son -- and I have wonderful son and family. I don't want my son doing for me what I've done for my husband and my mother. I've done it with love, but I don't think that this is the way to go. COMERAnd what bothers me, having written the book, Diane, is I wake up 20 years later and nothing has changed. The average caregiver, 48 years old. In the military it's 28, for the young post-9/11 victims of war, overwhelming, Diane, just overwhelming. REHMWe'll take a short break here. And when we come back, it's time for your calls, your comments. I look forward to speaking with you. REHMAnd welcome back. If you've just joined us, Meryl Comer is my guest. She is an Emmy Award-winning reporter, a veteran television producer and business talk show host. She's president and CEO of the Geoffrey Beene Foundation Alzheimer's Initiative which promotes early diagnosis, innovation and national public service campaigns. One-hundred percent of the proceeds from her new book "Slow Dancing With a Stranger" will support Alzheimer's research. REHMHere's an email from Jim who says, "I don't know how your guest can say Alzheimer's care is entirely out of pocket. Medicaid can and does pay for long term care for Alzheimer's victims. Yes, the victim has to meet certain financial thresholds but the spouse is shielded from this," Meryl. COMERMedicaid, I'm sorry. Because Medicare is another issue. REHMRight. What about house ownership? COMERHouse ownership is off the table, if I remember correctly. You know, I had advice, Diane, from elder care lawyers, shift your assets, protect yourself and bankrupt yourself. And I thought, that's a social safety net for people who really need it. Well, overtime we all need it. We're just slowing the bleed, the financial bleed of the disease. My heart goes out to families. They now have their children taking care of adults with this disease. COMERThe hardest thing that ever happened to me was my grandchild who came running out of my mother's room and said, Nana, Nana, I never thought Gigi could forget me. It just took my breath away. It is interrupting generations and our conversations with our children. Just horrible. But Jim, you're right. REHMHere's an email from Ron who says, "What is your opinion regarding euthanasia? COMERThat is a very personal conversation. I do know, Diane, that my husband would not consider this living. And I've cared with him a love every day. For myself, I think this is an important conversation we will have to begin having unless we begin to aggressively go after this disease the way we have gotten after HIV, Aids and cancer. COMERI mean, it also brings up another issue, Diane, and that is put your house in order. Don't - you know, it's always too soon before it's too late. And the problem with loved ones with dementia, by the time it's diagnosed, it's probably two years in. And by that time, it's too late to ask what your final wishes are. REHMHow do you take care of yourself? What do you do for yourself occasionally to get away and relax? COMERI work out. I do believe in exercise. I call it my survival training. I have wonderful women friends who have sustained me. I can't tell you -- they're the ones who got angry for me on my behalf when I was too exhausted to get angry. And I will -- I hike. Nature has always been restorative for me. But again, if I walk out the door, Diane, it costs me $25 an hour to just walk out the door. So I make my decisions very, very carefully. COMERI will say the idea is -- everyone says, oh, do respite care. Diane, when you put a loved one with dementia into another facility or take them out of a place where they have been, it is so disruptive that when you come back it takes you three or four weeks just to get them stabilized again. It is a constant shifting challenge. REHMHow do you carry on your work? COMERBecause it will take two of us, or I'm there to respond in case of an emergency. REHMSo you work to do what you must do for the Geoffrey Beene Foundation basically from your home. COMERThat's correct, except I travel on business, so -- when I have to. And someone takes the shift, my shift. REHMAll right. Let's open the phones, 800-433-8850. First to College Place, Wash. Marylou, you're on the air. MARYLOUThank you, Meryl. I'm looking forward to reading your book. I had the privilege and the pain of caring for my brother's wife, Blanche, who was diagnosed at the age of 49, who's a registered nurse and he's a physician. And at the same time. my husband's mother, Virginia, who was in her 80s, each of them had Alzheimer's. And my two school-age boys. And I wanted to thank you for being so open and for sharing about your pain and the privilege and the input that you are giving. MARYLOUI believe there are many, many people who are afraid to talk about this subject. And I just wanted to read, my brother wrote. He said, "I appreciate so much the companionship and support of my business family. Blanche, my wife of 37 years, is in the last stage of her life as she is losing her battle with Alzheimer's disease. She first began to notice difficulty with short term memory about eight years ago. Then. seven years ago. she was told by a neurologist she had early AD." REHMOh my. It's so hard. COMERIt's so hard, Diane. And it's so hard for people to watch because they -- it's almost a reflection in the young patients. The other challenge with caregivers in early-onset victims, Diane, is that they're moving in and out of a reality. COMERAnd the challenge is the caregivers are silent. It's their last hoorah. Who would take the independence away from a loved one? And that's why, again, you don't really see this underbelly, the side of the disease that would make us all so angry, Diane, that we would do what we've done for diseases like HIV Aids. And we all want the good fight. COMERDiane, I took care of a friend who had cancer. I saved her job. She came back. She had to leave again. And I visited her, Diane, and she couldn't stand up, but she let me put post-its -- she said -- post-its on every single thing in her house because she wanted to control the last decisions. Diane, Alzheimer's robs you of any decisions and the dignity of living. And the final insult, Diane, is your brain shuts down. You're breathing and it's over. REHMLet's go to George in St. Louis, Mo. You're on the air. GEORGEHello, Diane and hello, Meryl. I just wanted to commemorate you for what you've been able to do. And I know exactly how you feel. My mother was diagnosed with Alzheimer's at an early age. And it seemed to just progress so rapidly it was almost unreal. Like within months she was unable to talk and just unable to register who we were. You could see it in her eyes. GEORGEBut I know that you mentioned about care like in other facilities. And for me the bigger concern of having your loved one taken care of at one of these homes is that I don't think this has been mentioned and I haven't heard anyone else mention this, but the system itself, the Medicare system and the money that's involved in it is really taken an advantage by those facilities. And it's not the staff. The staff are wonderful, but the management staff is just -- they just seem to have no shame. GEORGEWe've gone through three different places because of this same reason, and so the third place was the best place because it was, I think, a Catholic-centered one. But it's just a really big concern and I don't think anybody wants to address it. COMERDiane, he makes a good point. And I would like to say something about men who take care of loved ones with this disease, Diane. I know what I've done for my husband. And when a man does that for a wife, it takes my breath away, Diane. It absolutely does. And some of the bets caregivers for men are ex-military, honor, duty, country. That sense of justice, no one left behind. COMERThe point your listener brings up is very important, Diane, in the care setting. You either manage the care at home or you manage the institution. If you go in, don't go in on the proper time. Go in when no one expects you. Undress your loved one. Actually check because the dementia patient is the ultimate victim. Abused, they don't remember and neglected, they forget. So I think these are the types of issues that are there. And it is run, Diane -- I've -- having slept on the floor I've watched it -- it's run to their timetable. And in a dementia world, it's flipped. It really should be about the patient. REHMWe have an email from Nancy who says, "When will we see a comprehensive national strategy? If this were an infectious disease, we would all be protesting in the streets. The economic impact is disastrous. With all the organizations involved, are we working toward a national solution to provide care, long term services that are affordable? COMERThe world is beginning to wake up, Nancy, to this issue in a major way. The U.S., by the way, is behind on this although we do have Napa which is looking at a plan. But there's no money to support it. And that's why we have to step out of the shadows, why I've been willing to step forward. Very difficult to tell a story like this and be as candid as I've needed to be to give other people permission to shout out with me, Diane, that this is unacceptable for our future. And we see it coming, Diane. If we can see the issues like ISIS and the threat underneath the current, this is no different. It's just a disease. REHMGeorge Vradenburg is fond of speaking to audiences, large audiences and having half the audience stand up. And he says to them, you who are standing will eventually come down with Alzheimer's. And most of you who are seated will become the caretakers. When will the congress realize what an economic impact this is going to have on our population? And you're listening to "The Diane Rehm Show." Let's go to Carol in Chapel Hill, N.C. You're on the air. CAROLMeryl, I want to thank you for using your abilities to address so very many issues related to this topic. And you've touched on so many, it's hard to know where to begin and what issues need to be addressed first. I was a caregiver of three people, both my parents and my aunt. That's why I've done this for ten years. CAROLTwo of them were in facilities, different facilities and then I had my mother living with me. I was committed to doing that for her. And I think, you know, dignity certainly is front and center of everything I'll do the rest of my life to address this issue. People can be so taken advantage of when they don't have things in order or a loved one like you. CAROLOne interesting thing I haven't heard brought up a lot to do with facilities -- and again, my father and my aunt were both in facilities. And they were known as being very good facilities but, you're right, there's no one there to take them out for a meal or get them outside, even with the best of care. COMERDiane, that's a liability issue for many of these organizations. So I think that's the point. I think something else that's happened that has really gotten me upset is that I was 48 years old when I had to leave the workforce. There are no better choices for young women today than there were 20 years ago. No disease modifying drug. So -- and the caregivers now, ten years off their lives if they take care of a loved one for any period of time with long term chronic disease. And six times more likely to get dementia themselves because of the stress of caregiving. REHMWhy do you think there has been no drug yet developed? COMERIt's the brain. It's the last black box of science. And we have to put dollars against this, Diane. We spend $220 billion annually on care and less than 1 percent on research. We are not paying attention. Is it ageism? Is -- what is going on? Denial? Dangerous denial. REHMAnd I know that many groups, including yours Us Against Alzheimer's, the Alzheimer's Foundation are trying to convince members of congress that Alzheimer's needs more research. Meryl Comer, thank you. Congratulations for this book. And thank you for transmitting your message. COMERThank you, Diane. I want everyone to come out of the shadows with me. REHMHer book is titled "Slow Dancing With a Stranger." Thanks for listening all. I'm Diane Rehm.